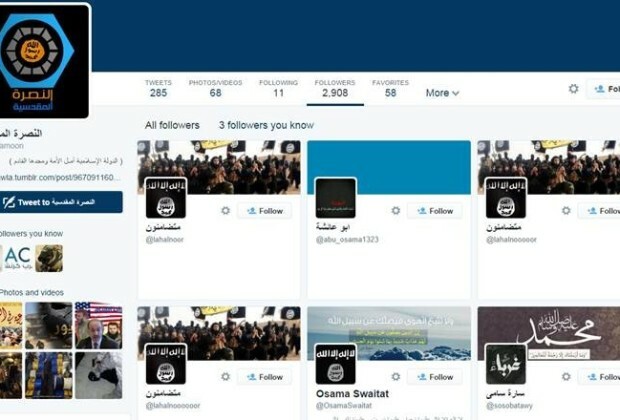 An ISIS-affiliated group has threatened to assassinate Twitter employees that close down their accounts. Users linked to the extremists tweeted a series of messages on Sunday urging 'lone wolves' in the US and Europe to make the firm their target. A specific warning was directed at staff at the Silicon Valley headquarters, warning they would 'bring the war' to San Francisco. One of the calls is believed to have come from Al Musra Al Maqdisia, or The Supporters Of Jerusalem - a Jerusalem-based group that pledged its allegiance to ISIS in February. The user then directly threatened workers at the Silicon Valley headquarters: 'Every Twitter employee in San Francisco in the United States should bear in mind and watch over himself because on his doorstep there might be a lone wolf assassin waiting'. And finally, they urged Europe to join the pledge: '#AttackingTwitterEmployees is on the agenda of mujahedeen and lone wolves who are across Europe'. The social network has been a crucial platform for the jihadis to promote their warped interpretation of Sharia law. The freedom of speech premise that underlies Twitter makes regulation of extremist propaganda almost impossible.